Fifth-century painters created stunning murals in dim man-made caves. A gifted photographer brings them to light. New Delhi, India -- Enchantment has many faces, but few compare with one painted 1,500 years ago on a cave wall in India. To see it, the eyes must first adjust to darkness. Soon it becomes impossible to turn away. The figure is of a bare-chested man; he wears a tall crown and holds a delicate lotus flower in one hand. His torso is curved as if swaying to music only he hears. His face is tranquility itself, eyes half-closed, lips pursed in a faint smile, his whole being absorbed in the sweetest dream possible. To see it, Behl and I drove out of Aurangabad, a provincial city east of Mumbai. We passed fallow cotton fields, the soil black as ink; swerved around cattle, their bells tinkling, their horns painted in bright blues and reds; and, after an hour or so, pulled into an overlook above a gorge of the Waghora River. More than two dozen man-made caves perforate the sweep of a dark basaltic rock face, their facades unexpectedly grand with pillars and statuary, reminiscent of the sculpted tombs and temples in the ancient city of Petra in Jordan. The lavishness of the Ajanta complex reflects its royal patronage; most of the cave temples were carved during the reign of a king named Harishena, who ruled a large swath of central India in the mid-fifth century A.D. Several hundred monks lived in the Ajanta caves. In the rainy season, from June to September, the gorge they overlook turns green with vegetation and waterfalls spill down the steep walls. During the driest months, the sun beats down fiercely and the riverbed is dust. The cool interior of the caves feels like a prayer answered. Inside most of the caves, designed as prayer halls (chaityas) and living quarters (viharas), a central chamber lined with columns opens into a shrine where a statue of the Buddha still waits. Along the outer corridors, doorways open to monks’ cells, bare except for stone beds. The architectural mood is solemn, reverential—until you look at the walls. With a glance, you step into an otherworldly vision. The most elaborate of Ajanta’s 30 caves were designed for enlightenment, many of their walls covered with inspirational paintings like the one of Padmapani. Only fragments of the once elaborate murals have survived the centuries, yet enough remain to summon the sensual and spiritual atmosphere that infused these temples. All of known creation surely paraded across these walls. There are images of the Buddha and of bodhisattvas—other enlightened beings. There are princes and princesses, merchants, beggars, musicians, servants, lovers, soldiers, and holy men. Elephants, monkeys, buffalo, geese, horses, and even ants join the human throng. Trees bloom, lotus blossoms open, vines curl and reach. Most of the figures inhabit crowded, intricately composed murals that tell stories, called jatakas, from the many past lives of the Buddha. Others depict incidents from the life of the historical Buddha, an Indian prince who lived a thousand years earlier. The paintings serve as illustrated classics, fifth-century style, meant to awaken devotion and heighten spiritual awareness through the act of seeing. For most visitors today, the tales are arcane. Yet the sensation of watching the images emerge from the dark in all their grace and beauty links then and now. A vision of paradise never grows old. Few visitors have been affected more powerfully than Benoy Behl. When he first visited the cliffside caves in 1991, he posed himself a challenge. Was it possible to photograph the cave murals using only available light? By then Ajanta had gained international fame as a UNESCO World Heritage site, but decades earlier, misguided conservators had applied shellac to the murals, distorting their colors. More recent efforts to clean the surfaces have improved their condition. Even so, when seen or photographed with artificial lights, the colors and scenes often appeared flat, drained of vitality. Behl had already succeeded in creating nighttime images of the Portuguese-era cathedrals in Goa, on India’s west coast, with only moonlight for illumination. He set out to try a similar technique at Ajanta, using the dim natural light in the caves to dispel the darkness. For two years Behl photographed every human, animal, plant, and deity on the walls and ceilings, in close-up or as parts of larger compositions. Working with a tripod, often standing on a simple wooden table, he would leave his shutter open for minutes at a time. The results were a revelation. When the director of the Archaeological Survey of India saw Behl’s images, he exclaimed, “You have really conquered the darkness.” Art historians reacted as if they were seeing a great work of art for the first time. Behl proceeded to publish a book of his Ajanta photographs and exhibit them around the world. He also undertook an ongoing series of films on Indian painting and sculpture, making high-quality photographs of other premodern paintings, including ones from the remote Buddhist monastery at Alchi in the Himalaya and the monumental Brihadishvara temple in Thanjavur in southern India, a Hindu site. 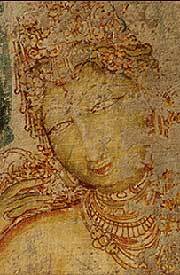 Developments in sacred imagery fed the artistic blossoming at Ajanta. This was the era when the figure of the Buddha achieved an idealized, perfected human form. At first, artists had relied on symbols—footprints, a tree, an empty throne—to represent the historical Buddha. But followers wanted a more personal focus for their devotion. The likeness invented on the Indian subcontinent in the first centuries A.D., with lowered eyes and serene expression, would become the prototype for Buddhist images across Asia. It remains the indelible face of the Buddha today. Around the same time that Ajanta reached its full glory, freestanding stone temples proliferated to honor the principal Hindu deities of Shiva and Vishnu, depicted as powerful, multiarmed beings. Buddhist and Hindu sites alike overflowed with images whose fluent form and expressive character have rarely been matched, releasing a new fervor in worshippers. That this flowering took place simultaneously within both religions is not surprising. The essential tenets of Buddhism and Hinduism arose from similar ideas, best described in the Upanishads, a set of Hindu treatises set down in India largely between the eighth and fourth centuries B.C. These sacred texts envisioned the human self as one with the divine essence, “the real behind the real”—an abstract life force called Brahman. The flow between faiths was such that for hundreds of years, almost all Buddhist temples, including the ones at Ajanta, were built under the rule and patronage of Hindu kings. A profound aesthetic belief also united the two religions. Beauty meant nothing in itself: A work of art, whether a bronze statue of Shiva engaged in his cosmic dance of creating and destroying the universe or a painting of the Buddha attaining enlightenment under the bodhi tree, amounted to no more than base metal or dried pigment until a viewer responded to it. Seeing a painting or sculpture in a temple opened the minds of receptive worshippers to intimate communion with the divine. Seeing was believing. Hindus call this intense participatory relationship with art an act of darshan, or “seeing” the deity. “Such seeing does not literally mean merely using one’s eyes,” according to art historian Vidya Dehejia, “but is a dynamic act of awareness.” For the Buddhist monks and their patrons at the Ajanta monastery, paintings of the Buddha served the same potent function, providing a key to revelation. These effects flow in part from technical skill—sophisticated shading and highlighting, multiple perspectives (some figures seen at eye level, others from above or below), long expressive brushstrokes. The anonymous painters would have been members of an artisans’ guild, as adept at painting Hindu deities as Buddhist bodhisattvas. They may have followed rules laid down in one of the oldest known treatises on painting, a Sanskrit text called the Chitrasutra. A collection of oral traditions likely dating from well before Ajanta, the Chitrasutra (“discourse on painting”) contains thousands of tips, from how to paint a lotus with exactly 52 petals to how an artist should wash and dress. It also specifies an ideal look for deities, supporting characters, and nature scenes. Yet the Ajanta painters infused the work with their own individual geniuses, evident in the grace and expressiveness of many of the figures.